Whether you are a parent looking for a musical instrument for your child, a musician who can not have a big piano due to neighbors or space or a professional player looking for an alternative to a classical instrument with multiple sounds, you will sooner or later become acquainted with digital pianos. The digital piano is a musical instrument whose main function is to faithfully reproduce its acoustic pre-images from piano to large concert grand pianos. In addition, the digital piano offers the benefits of advanced audio processors, sound banks, and electronic arranging and recording of songs. How to choose such a piano correctly? While the digital piano mimics a smaller piano with vertical string guidance, digital grand pianos give the player the feeling of playing an authentic concert instrument. However, if you are selecting a beginner instrument, then the digital piano is the ideal choice for you, especially due to the higher price of digital grand pianos. One of the main strengths of digital pianos is the keyboard, which should mimic an ordinary piano with all its nuances and details. Some people do not like playing on matte keys, while others do not like the "slippery" glistening feeling. In terms of material, it is usually an optimal imitation of ivory at least with minimal absorbent properties, which contributes to the overall comfort of playing. The basis of each digital piano is the hammer mechanism that simulates the feel of the striking hammers on a real piano. Depending on the price of the digital piano, such mechanics are then prepared in the so-called linear variant (all the hammers are equally hard) or graded when the hammer on the bass keys is heavier and in the alto lighter than the real instrument. Escapement - This feature simulates a situation where the key is inadequately pressed and on a real instrument the string would not start playing and the tone would not sound. The sound processor is the heart of any digital piano, and its quality has a decisive influence on the sound quality of the piano you purchase. Each processor contains recorded sounds of an actual piano, but for the cheaper ones, the entire keyboard is usually not recorded, but mostly only the selected tones complemented by a computer raising or lowering of the recorded tone. There are, however, digital pianos that have the complete keyboard from a premium and expensive concert models, in several stages to simulate the perfect keyboard stroke dynamics. In addition to the basic classical piano sound banks, the strength of the digital piano is also a number of other sounds and voices from classical keyboards with a wealth of instrument effects up to the highly sophisticated simulation of old synthesizers or electric pianos. These digital piano options are even more outstanding thanks to special features such as: Dual tone or layer - the ability to connect two sound settings to a single key so that by pressing one key, the sound of the piano as well as the corresponding tone of the violin can sound simultaneously. Keyboard split - the option of splitting the keyboard into two parts and use a completely different setting for each part. You can thus play the melody with the sound of the piano, and play the bass using the organ. In many cases, the sound processor serves as a tool for composing your own songs, which it cannot only record, but often analyze and add, for example, a chord accompaniment. Similarly, this feature will serve as a teacher when the control unit displays the song's sheet music and waits for the correct tone to be pressed, or counts the exact rhythm and binding of tones. In addition to these features, you will surely appreciate the possibility of linking your digital piano to your computer or other smart device using MIDI or USB. Thanks to this, your piano becomes a full-fledged studio periphery that you will connect with your music software without any problems. Just as easily, we can back up your songs recorded directly into the piano or expand your piano's memory with new songs or new sounds if the manufacturer allows it. One of the biggest advantages of a digital piano is that you can fully control the volume of the built-in speakers or listen through headphones. That's why most digital pianos are equipped with a headphone’s output on a 6.3 stereo jack and very often also a stereo RCA (cinch) output or 2 mono 6.3 jacks. On professional digital pianos, you can also find a pair of XLR outputs for direct connection of the instrument to the mixing console or sound system. The most suitable accessories for digital pianos are definitely the piano stools with an adjustable height, various protective felts on the keyboard or closed-ended headphones. In principle, you do not need a metronome with digital pianos, because its function is probably contained in all instruments currently on the market. If you are considering purchasing a beginner's instrument, we would also recommend you discounted sets with the chosen accessories, which appear in the digital piano section of our e-shop. If so, then nothing is preventing you from choosing the right piano just for you. 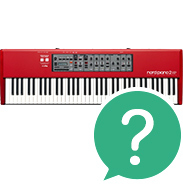 If you still have some questions or uncertainties about the choice of a digital piano, then be sure to contact us at tel. 020 8089 1481 or the e-mail where our experienced colleagues will be happy to advise you on what piano is best for you.